Strasbourg is the formal seat of European Parliament and the capital city of the Grand Est region in north-eastern France. The city is populated by just under 300,000 people and is famed for its wealth of European culture, incredible views of the Rhine River and amazing blend of German and French inspired architecture, like the renowned Cathédrale Notre-Dame. Cheap flights to Strasbourg are now available for a limited period of time, so prepare to be romanced by this beautiful and unique city! Strasbourg is home to the Strasbourg Airport (SXB) which is just a 15-minute drive from the city centre. 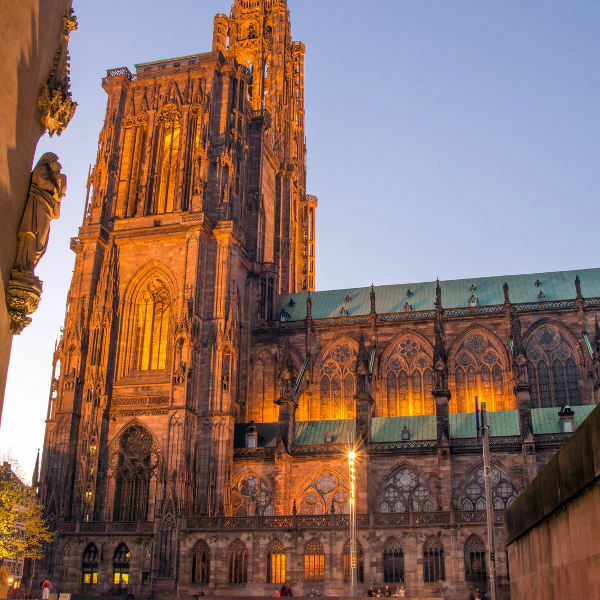 Strasbourg’s skyline is an incredible blend of German and French-inspired architecture and is home to the magnificent Cathédrale Notre-Dame, a famous example of late Gothic architecture. The beauty of the Rhine River paired with medieval buildings on the Grande Île island create incredible views to behold while strolling along the riverside or a romantic boat tour. Strasbourg is a dynamic city where there are various bars, boutiques and modern or traditional restaurants to discover on the riverside of La Petite France or the Place Kléber city centre. 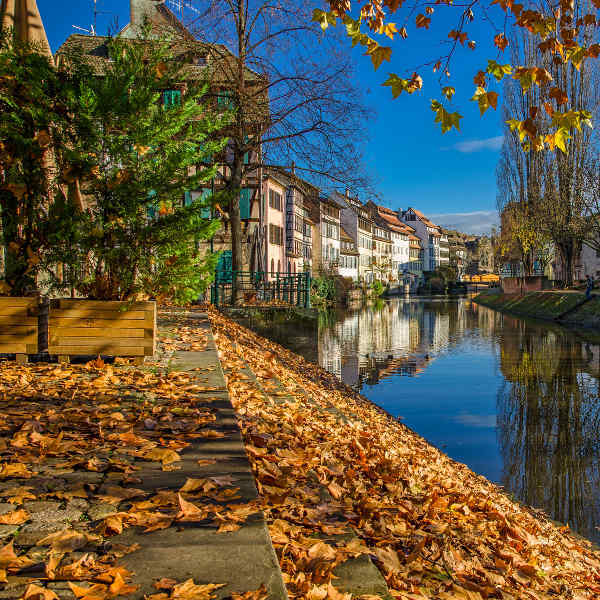 Strasbourg experiences an oceanic climate which creates warm, sun-filled summers and cold, cloudy winters. The summer months between April and September attract many travellers to this scenic city dubbing it the peak tourist period. In May, art galleries and museums around the city come to life for the annual ‘Night of the Museums’. For one night, the public is allowed in to explore the art, amazing exhibitions and take part in various exciting activities free of charge. The annual ‘City under the lights’ festival takes place in July, one of the warmest months in Strasbourg. As the warm summer air lingers, take an evening stroll through the streets and enjoy the colourful show of lights decorating buildings, fountains and churches, each design accompanied by music. February, March, October and November are less popular tourist months in Strasbourg and a trip at this time may prove to be lighter on your pocket. Despite the chill beginning to set in, there is still a lot to do and see in this dynamic city. November’s annual Strasbourg Jazz Festival attracts musicians and music lovers from all over the world. Enjoy the rhythms and smooth sounds of jazz at various music halls, theatres, clubs or street corners during this festival. 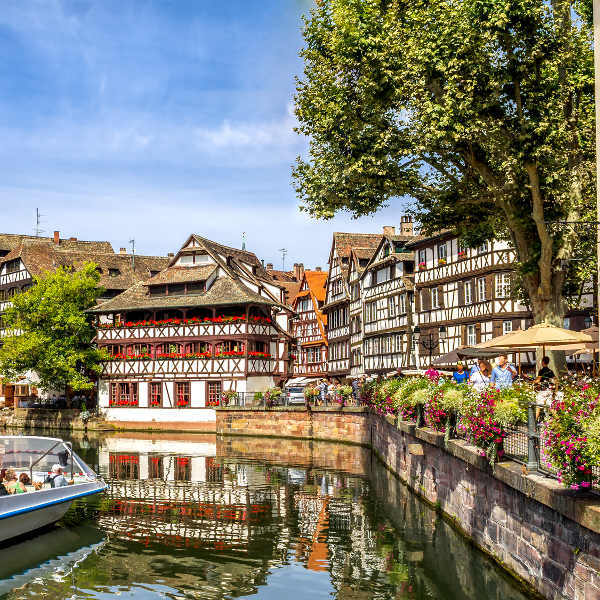 Strasbourg is a sought-after tourist destination in north-eastern France famed for its dynamic culture, incredible views of the Rhine River and seamless blend of German and French-inspired architecture spread across the city districts. This city is the formal seat of European Parliament and the capital city of the Grand Est region. With this high level of importance and its wealth of culture and history, the city is naturally home to magnificent attractions and monuments to explore, such as the renowned Cathédrale Notre-Dame and the Grande Île Island it is located on. You can explore the island on foot or take a romantic river boat tour showcasing the city’s scenic views of the beautiful La Petite France area, the 19th century buildings in the imperial district and the European Parliament and Council buildings. The riverside of La Petite France, other districts along the river and the Place Kléber city centre are all home to picturesque, modern and traditional restaurants. Stop to enjoy the flavours of local dishes like Sauerkraut or a hearty stew or just mull over the day’s events with locally brewed beer by the riverside. Strasbourg is a vibrant city filled with unrivalled holiday experiences for all. Compare several airlines, and book your cheap flights to Strasbourg online at Travelstart. Make sure your routine vaccines that include the MMR vaccine, DPT, Chickenpox, Polio and yearly flu shots are updated before travel. Vaccinations for Hepatitis A and B could be considered but are not required. Tap water in France is drinkable. Strasbourg is a fairly safe city with a low crime rate. However, you are advised to practice general safety precautions such as keeping your valuables and important documentation safe and watching out for petty crimes like bag-snatching or pick-pocketing. The Hautepierre, Les Halles, railway stations and city centre are petty crime hot-spots. You should always remain aware of your surroundings and when you are in the city centre at night try to travel in a group.